Me-Made-May has become a sewing community holiday. Every May, my Instagram feed (and I’m sure yours as well) is jam packed with me-made after me-made. This year we decided to participate as an office, posting our makes on the Colette and Seamwork Instagram daily, but five of us pledged to wear me-mades every day of the month. I sat down with the ladies of the office and chatted about the lessons we learned and—perhaps more importantly—how we can apply these lesson to our sewing in the future. It was no surprise that we all had similar take-aways. Most of us discovered that we had more me-mades than we thought. Sarai even added that she was unable to share all of her favorite me-mades. This challenge forced us all to dig a little deeper into our closets and wear things that may not be in our regular wardrobe rotation. I know that I, personally, fell back in love with some forgotten gems. A common wardrobe gap amongst us was separates. So many of us found that we simply did not have that many. I think I see a lot more functional pieces that are easy to mix and match in our collective future. Lastly, we all have entered June with a renewed sense of inspiration. The whole office is buzzing with sewing plans. Some of us are even revisiting Wardrobe Architect to really help us focus our sewing plans. 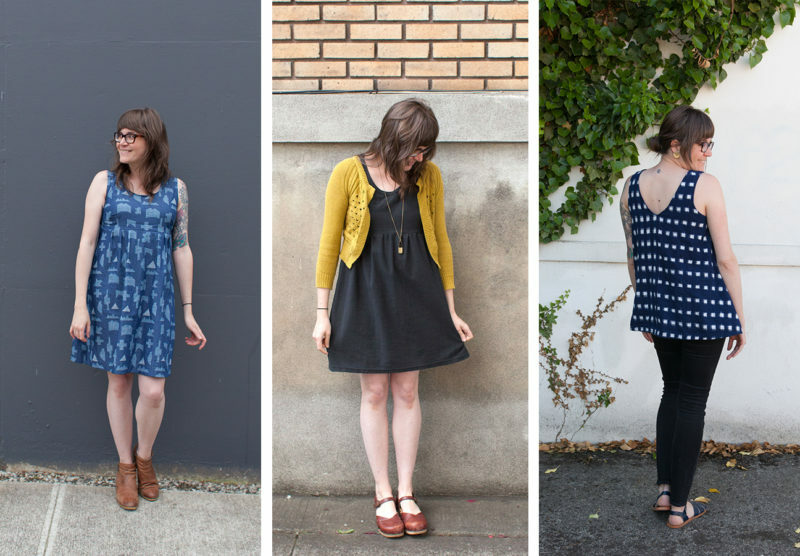 We all LOVED seeing your Seamwork and Colette makes patterns that you all shared this last month. We were absolutely blown away with your creativity and mad sewing skills. What have you learned about your sewing habits during Me-Made-May? Are you relieved to be done taking daily selfies? Have you identified any big gaps in your me-made wardrobe? What are your sewing plans? Is anyone else revisiting Wardrobe Architect to help refine your sewing queue? Sewing Chatter: What have you learned from Me-Made-May so far? I love MMM, as I am an isolated sewist, living in a rural area. To see so many others around the world sharing my passion is brilliant! While relieved not to be taking daily selfies, i really wanted to incorporate a more cohesive wardrobe idea, with mixing and matching, not necessarily wearing a me made everyday, but not having any wardrobe orphans than only get worn with a certain outfit! I am starting an overhaul of my sewing/office area so haven’t been able to sew anything, but have lots of plans! Hi! Another lonely (only IRL, I definitely don’t feel lonely in the online sewing community) sewist here. Like The Crafty Scrivener (hello! ), I’m happy not to be taking selfies every day anymore but will readily admit that they have proven extremely helpful. Me-Made May has definitely led me to reconsider my sewing plans. – I need to face my fear of fitting and sewing pants. That’s a tough one. My next step: working with the selfies and the Wardrobe Architect worksheets a bit more closely to make some silhouette-related decisions. This year was my first time participating in MMM and I found it difficult for a couple key reasons: 1) I don’t have enough me-made items to cycle through the month, 2) I started training for a triathlon, which took my time and focus away from sewing. So I’m quite envious of those who made it through the month and added new me-made garments within the month as well. My intention is to sew my stash with the little time I have while training and to get back into it full force after the triathlon is over! I also didn’t put pressure on myself to take daily selfies mostly because I was cycling through the same handful of tops. And while it was a relief to take that pressure off of me, I learned that the daily (or every other day) selfie is a good system of accountability for me. It is what I used for my personal challenges in prior months and is a great way to document progress. I love all your outfit photos above! Anna, I especially covet that top in the first photo! I did MMM two years ago and struggled– I was a new sewist who had mostly teeshirts and was afraid of wovens and learning how to fit my body. I skipped last year- no time! But this year, with two more years of experience under my belt, I found it much easier and I never felt constrained or frustrated by trying not to repeat outfits, like I had in the past. 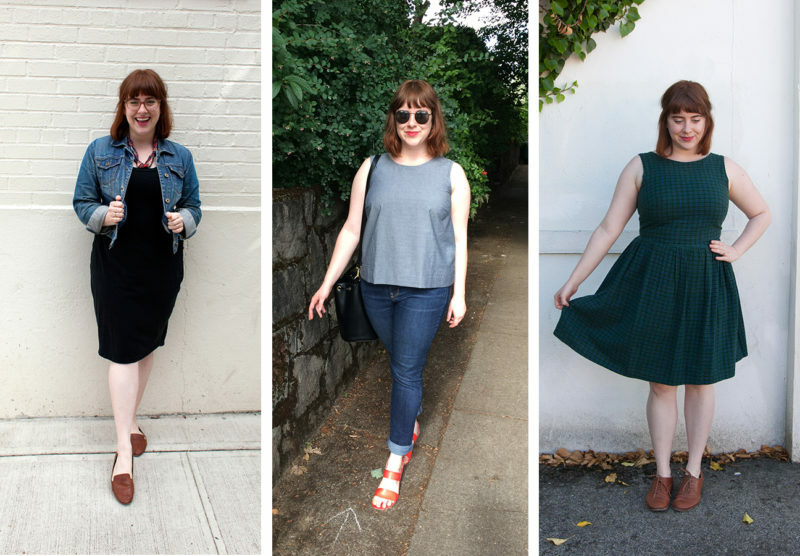 I really feel like I am zeroing in on my style and also my needs– right now, I am well-stocked for work clothes, but my weekend wardrobe is a bit blah and could use some TLC! 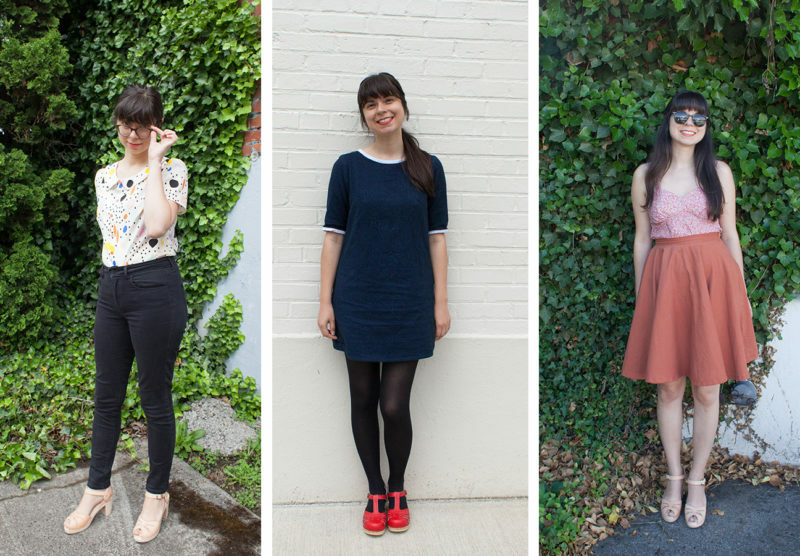 I ended up giving each of my outfits for MMM a grade over on my blog, like in school, depending on how I felt in it, whether I felt like me, whether it was appropriate for what I was doing that day, and just whether I liked it. It helped! I am a new enough garment sewer that I did not do Me Made May this year (maybe next year–for now I did wear what I have made a lot last month) but I loved seeing everything on Instagram! I would love to do the Wardrobe Architect in the meantime to get ready for next year. What is the pattern for the black and white skirt Sarai is wearing? It is just lovely! I enjoyed me made May; I only did a 3 garment per week challenge, and I did A LOT of repeats, but I love all the garments I wore. I continually go through my wardrobe and refine it, so it was nice to see that I am “one” with my fashion sense. I know what I like, now to make more of it ! This is my first me-made may and I learned so many things about my wardrobe and how I look at clothes. 1. Me-Made May is an intensely body-positive experience and I loved my Instagram feed full of super-happy looking ladies wearing awesome clothes. It also gave me the confidence to rock garments I was previously hesitant to wear to school (check out my seafoam green horses peplum blouse – it’s pretty ridiculous) and only managed to mustard the courage to wear it after getting so many likes on Instagram. 2. My spring wardrobe needs a serious update. 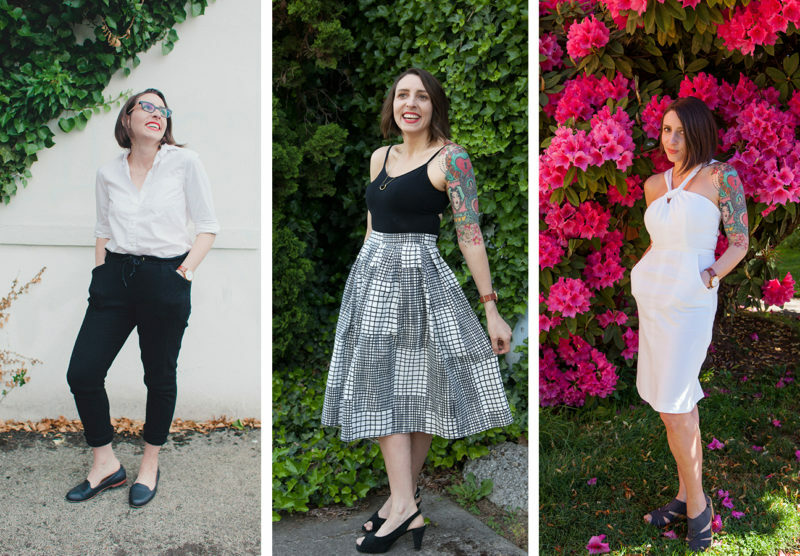 I started shifting my sewing focus this fall to more casual, wearable separates (well, tops, really. ), but all of my spring makes are cute blouses and skirts. I’m realizing that I don’the actually wear adorable dresses every day, nor do I want to. 3. I just need to make some fricken pants. I’m short, have strong thighs and a small waist, so pants never. ever. fit. Like, ever. You would think this would drive me to make my own, but no, it has terrified me from spending hours and hours on pants that still don’t fit. 4. I need to be more strategic about colours and patterns I pick. I went through a phase last summer where I attempted to make a capsule (which failed. Seriously, all three pieces that were meant to be my base never made it out of my closet), but I went fabric crazy last fall and just bought anything I liked. Which means I have a whole lotta randos that only go with very specific items. I think I’ll be looking back to Wardrobe Architect heading into fall 2016. I can’t claim to be sharing this out of a place of deep sewing wisdom and experience, because so far I’ve only gotten as far as cutting out the pattern for my first pair of pants. However, having read my recently received copy of “The Complete Photo Guide to Perfect Fitting” cover to cover, I can say that it’s insanely detailed and *seems* like it will be very helpful. Maybe that would be worth the investment for you? One other suggestion for your first pants pattern is to look for something designed to be made with a non-stretch woven so you can buy really cheap fabric and make as many fitting muslins as you need before making the actual pants. I picked Clover for my first pants, which is intended for a stretch woven. It turns out the instructions say that it doesn’t really work to make a muslin with a fabric with a different amount of stretch than your final fabric, so I’m just going off the pattern measurements and winging it… Fortunately the fabric was inexpensive. Fit for Real People is also an excellent resource for fitting! I will definitely be using it as I dive into some pant making. I didn’t officially participate, but even as a spectator I became very aware of how much my lifestyle has changed over the last few years – creative office job to stay-at-home-mom-of-2. Used to wear a lot of slightly fussy, vintage type stuff. Now I need different things, practical things that still make me feel good (and that I can nurse in, AND will forgive a possibly-still-fluctuating waistline), so I don’t fall into the sweats and t-shirt trap. I will definitely be looking through wardrobe architect! Like others have mentioned, MMM was inspiring and a fun experience, even as an observer/non-official participant. I didn’t think I had enough me made pieces to wear for the month– but I did! 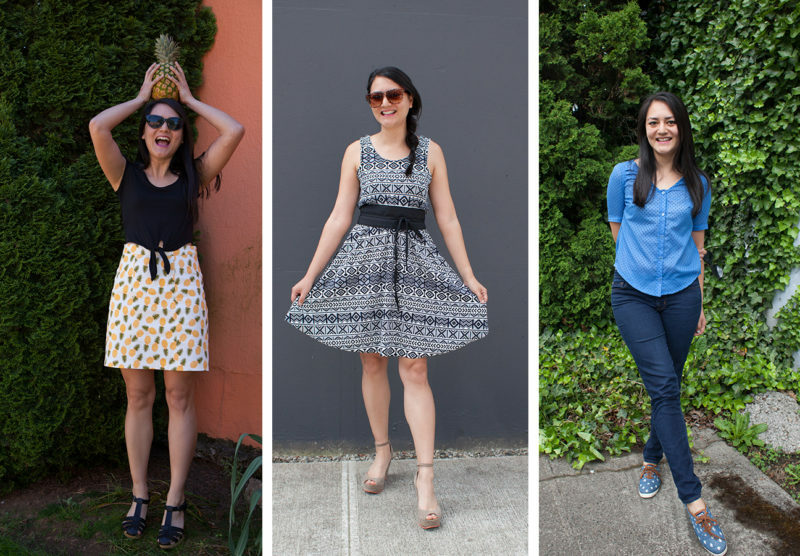 As I transition from grad student to full-time professional, MMM is an excellent way to discover the pieces that I enjoy wearing, can feel comfortable in for 16 hour days, and feel beautiful wearing. Pants are a must-sew! I’ll get around to those….one of these days. The Wardrobe Architect has been so helpful! I printed it out and got it bound over a year ago– and I still use it! Wearing nicely finished garments that fit properly will always make you feel better. Careful planning (before cutting out!) is hard at times, but truly does result in something you can wear time after time. 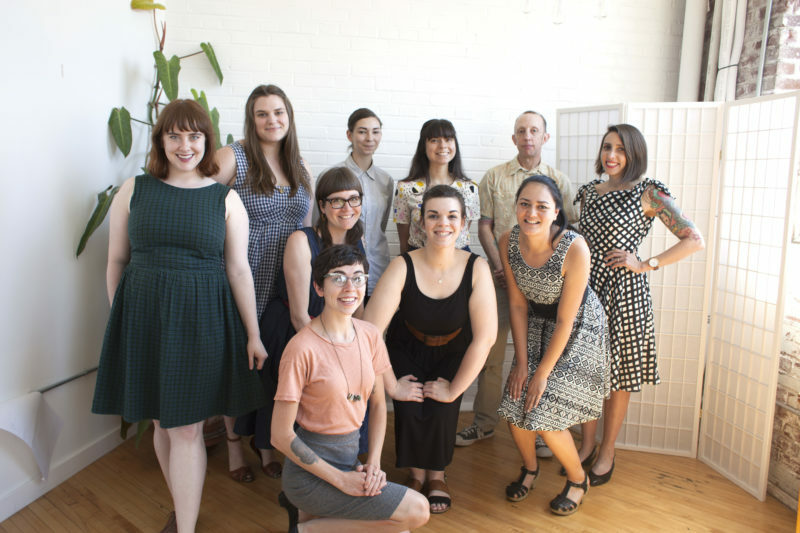 While I did not personally participate in MMMay, I absolutely loved looking at and reading about what the sewing community was making and wearing. Among my family, friends, colleagues, and classmates, I am the only person who likes making my own clothes and accessories, so I really rely on the online sewing community for inspiration, encouragement, and the development my skills. Participants: I know you get tired of taking those selfies (if you made that part of your challenge), but please know I LOVED each and every OOTD and me-made styling pic you posted. Thank you! Now I’m crossing my fingers for MMMay17 – I’ll be done with grad school then, so I hope to participate in all of the things I put on the back burner for the past two years. I love the MMM posts! I didn’t participate this year, but it made me re-evaluate how I approach not just my wardrobe, but my beauty routine and daily habits. It’s felt rather indulgent to incorporate healthier and more sustainable options. It’s very inspiring, so thank you for sharing your thoughts. Also, I am totally in love with Anna’s red shoes. It was my first MMM and I enjoyed wearing all my garments, even if I was cold all the time. I wasn’t able to wear the light dresses I have. I have identified that I need more warmer garments and need to avoid prints! I didn’t like the selfies. This was the first time I’ve attempted participating in MMM and I quickly grew exhausted taking photos of me in my outfits (selfies hard) or photos of my outfits laid out attractively. It made me feel very vain and uncomfortable. That said, I did truly value seeing what people actually wore, how they wore it, and more to the point, when they repeated it. I have some very heavy rotation items (pants pants pants) and lesson learned: taking the time to do a great finishing job pays off in clothes you return to again and again. I went in with the goal of just doing 3-4 times a week, and determining what in my closet is still wearable after having a baby (and about 15 extra pounds that haven’t gone away yet). I still need to finish the closet purge, but discovered a lot of old things that I can still squeeze into. My biggest hole was in casual things I can just wear around the house, especially jeans. Also, thank you thank you thank you for Seamwork, because I’ve been so short on sewing time with a kid who won’t nap unless someone is holding him, that your patterns are largely what’s enabled me to keep sewing over these past 11 months! I enjoyed me made May this year. The flickr pool was really fun to follow along, and I definitely found inspiration in the photos there. I only made two items, and that was a coincidence, I wasn’t trying to make a lot of clothing for myself as I was sewing for a few upcoming babies (not mine)! Something that I always get hung up on is, weirdly enough, shoes. I’m never sure what goes with what. Successes for me were wearing many of the bottoms I have made, and wearing pieces that languish in the closet a bit. I was able to evaluate what was wrong with them, to an extent. Things to work on would be t shirts (once my current crop of rtws die), layering pieces like cardigans, jackets, and hoodies, and casual bottoms.